California is now home to the nation's first large-scale program to help transgender people find jobs. The goal of the new California Transgender Workplace Project is to eat away at the unemployment rate for trans people, which is twice the rate of other Americans. The numbers are even worse for trans people of color. The project will place trans job seekers into entry-level positions at restaurants throughout the state, in collaboration with the California Restaurant Association. As an incentive to owners and managers, the first 60 hours of a new hire's wages will be paid for through a $150,000 grant from the California Workforce Development Board. And this is all because of Michaela Mendelsohn, a trans woman who has employed trans people at her restaurants for years. The El Pollo Loco at South Western Avenue and Venice Boulevard was all hands on deck one recent afternoon. Even though the lunch rush ended hours ago, workers were frantically running around filling orders, chopping onions and searing hundreds of pieces of chicken. Three of those workers rushing behind the counter were trans, including Delaney Martinez. "I feel like it's a supportive atmosphere," she says. Small gestures like being called what she wishes, instead of what may currently be on official documents, meant the world to her. "I'm able to have my name tag as I wish, and I just feel more comfortable," says Martinez. "With being comfortable, I can give better service." This restaurant is the first El Pollo Loco owned by Michaela Mendelsohn. She opened it in 1988, and it's one of six locations she currently owns in Southern California. Mendelsohn says she fosters an atmosphere in which she backs her trans employees despite what customers might say. "You know you always hear the thing, 'The customer’s always right,' " she says. "In my restaurants, the customer’s always right unless they attack you personally." Mendelsohn transitioned in 2005, taking a year away from work and without saying a word to her employees or other franchise owners. "They thought I was dying of cancer because they just assumed, ‘Well, he just disappeared. He’s sick,' " she recalls. When she reintroduced herself to her staff and colleagues, she braced for the worst. All she got was love. "The franchisees basically lined up for hours to give me a hug and wish me well," Mendelsohn remembers of the first conference as Michaela with other El Pollo Loco franchise owners. At a holiday party for her own staff, she didn't hear a nasty remark, either. "I’m the boss, so no one’s saying it to my face," she smirks. She was the only trans person in her restaurants for years, however, until 2012 when she hired her first trans employee. That person told Mendelsohn of the troubles she had securing entry-level jobs at many places. She was mysteriously told during interviews that there were no open positions, and recalled how hiring managers would laugh or scoff when she entered the room. Mendelsohn was profoundly affected, and began collaborating with the Los Angeles LGBT Center and the TransLatin@ Coalition to find other out-of-work trans people and to offer them jobs. "The word’s just gotten out that I’m a trans owner supporting trans people," she says, estimating about 8 to 10 percent of her 150 employees are trans. Mendelsohn batted around the idea for years of how to expand the success of her work into something bigger. She got that chance this year when the public awareness of trans issues grew to an all-time high, both with the transition of Caitlyn Jenner and the acrimonious fight over North Carolina's law that restricted which bathrooms trans people could use. So several months ago, Mendelsohn met up with her colleagues at the California Restaurant Association, one of the biggest state industry groups for restaurants. At a hotel bar, she chatted up her longtime friend and head of the association, Jot Condie, about the difficulties that trans people face in the work world. She also invited him to meet with trans people at the Los Angeles LGBT Center who were desperate for a job. "I considered myself as somebody who had my head in the sand when it comes to what they’re really going through," says Condie. "This is a civil rights issue." Then Mendelsohn floated her ambitious idea to Condie: Help her back a jobs program that would secure jobs for trans people at restaurants. The benefit to owners and managers would be a new worker, which are in desperate need right now because of a nationwide labor shortage. "It's tougher than in the past 12 years to find employees," says Mendelsohn. "We can’t afford, as restaurateurs, to exclude qualified employees." She also collaborated with the Los Angeles LGBT Center, the TransLatin@ Coalition and more organizations to be a part of this program. Now, she just needed to sell other restaurants on the idea, too. 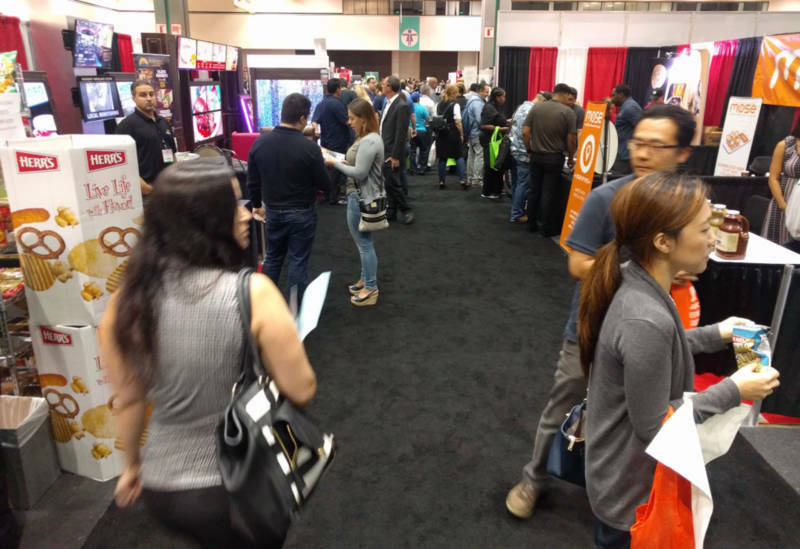 The Western Foodservice and Hospitality Expo is one of the biggest trade shows in the country for restaurants, with more than 10,000 attendees at this year's event in late August at the L.A. Convention Center. 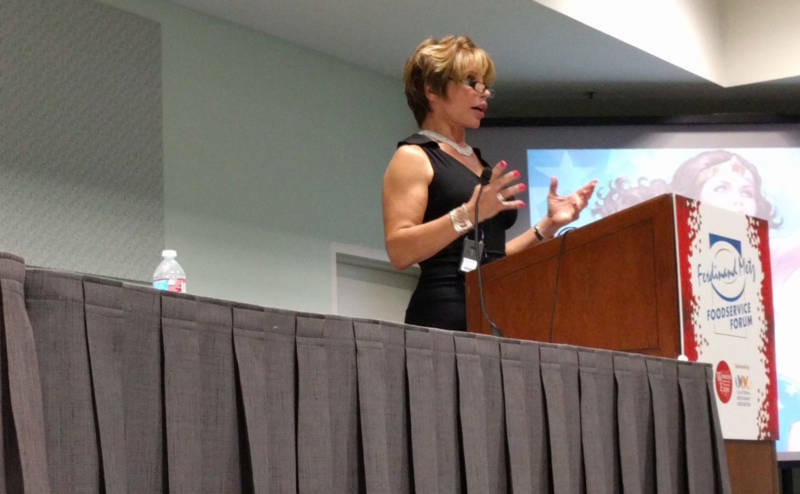 The California Restaurant Association sponsors the expo, and it used the gathering as an opportunity to host the first of six seminars for its members interested in the program. Restaurant owners and managers would need to attend at least one of the sessions being held throughout the state in the coming months. They'll learn how to apply, the issues that trans people face in the workplace and how to support their trans staff – call it "Trans 101." "Trans people are vulnerable when we come into the workplace," Drian Juarez, from the Los Angeles LGBT Center, told the room. "If somebody makes fun of us, we may not have the wherewithal to stand up for ourselves because we don't want to jeopardize our jobs." Not everyone believes it's the right thing to do right now, however. Expo attendee Grant Theim said he believes everyone should have a right to a job no matter who they are, but that other Americans might not be ready for this idea. "I still think that there’s a majority of people out there that might have a problem with being served by somebody that’s transgender," he says. But Mendelsohn told the seminar that her restaurants are a good example of how that's not necessarily true. "The customer compliments on our transgender employees started coming in. Lots of compliments," she says, "and our stores have consistently climbed in sales." Drian Juarez also says that a growing number of industries are welcoming trans people into their workforce, and are writing LGBT-friendly guidelines into their HR handbooks. "You will always have people who don't like trans people for whatever reason," she says, "but it's not about changing that person. It's about getting them to a place where they understand that when you're at home you can believe whatever you want. But when you're in the workplace, you will follow the law and treat everyone with respect." Mendelsohn and the association say they hope their effort will convince other industries around the country to follow their lead, and that it will be a great encouragement for trans people to head back into the job market. "I promise a trans person a level playing field," says Mendelsohn. "I don't promise them a bed of roses. They're going to need to work hard like everyone else."